Thom Brucie teaches Creative Writing at Brewton-Parker College in Mount Vernon, Georgia. He is the faculty advisor for Oracle, the literary journal, and he is the founding editor of the Journal Of The Georgia Philological Association. A story collection, Still Waters: Five Stories, was a Georgia author of the Year nominee in the short fiction genre. His poetry has appeared in a variety of journals, including Southwestern Review, San Joaquin Review, Pacific Review, Cappers, DEROS, and others. His chapbook, Moments Around The Campfire With A Vietnam Vet is forthcoming from Červená Barva Press. Kelley Arnold is the Director of News and Public Information at Brewton-Parker. Her freelance work has appeared in Toombs County Magazine, The Press-Sentinel (GA) and The Somerville Journal-Scene (SC). Under her leadership as editor of The Telfair Enterprise (McRae, GA), the newspaper won 11 Georgia Press Association awards. Your chapbook, Moments Around The Campfire With A Vietnam Vet, is unusual in that the poems are framed by a discovery story. An uneducated and backwoods couple, sitting around a campfire, discovers a satchel full of old papers. You know, they almost remind me of Hobos, themselves without a true home - a product of one too many wars and a stunted society, perhaps? And this couple is happened upon by what could only be determined as a Ghost, a fallen soldier it seems. Then you discover that he is not only the catalyst for the fiction, but he's also the voice of the poetry. It was such a novel experience for the reader, one that I thought was very effective. Why did you choose such an approach, and what did you hope to achieve? Your comments make me laugh a little. I asked two poet friends of mine to read the work, and one loved the frame, said it was a unique opening to a chapbook of poems. The other hated it, said it made her feel as if I were somehow uncertain of the strength of the poems; the poems are strong, she insisted, and don't need any introduction. 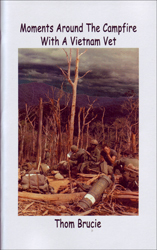 The inspiration for the introduction had more to do with Vietnam than with poetry. I didn't want the collection to appear as a complaint; Vietnam was such an emotionally charged time you know. I wanted the frame approach to act as an invitation to the past, since Vietnam is a past war and nearly out of contemporary memory. What I hope to achieve is a reading experience that initiates a discovery process, one that encourages readers to think about the indignities that befall individual participants of wars; that each participant is not just a cog in the machine; that each one has value. Moving from the frame to the poems, the Ghost tells of the atrocities and sadness of war, of lost loves and lost innocence. Rather than the mutilation of bodies, you see the depravation of souls, or at least I did. And I love the way it is delivered, rather than through the loud crack of a bombshell exploding, these poetic tremors have a quiet poignancy and urge reflection. Is this collection then a war protest? I believe in protesting violence in all its manifestations, and the violence of war is a most horrendous evil. But the poems, and the collection taken as a piece, are not intended to protest; rather, I hope that readers will feel the unique experiences of each person in each poem. No two witnesses at an auto collision see the same accident; neither do any two witnesses to war see the same event. Human history tends to glorify war, but the glory of war, if there is any, must lie in the lessons of charity that individual survivors bring to the benefit of their community once the violence ends. The components of the frame establish the feeling of story. They invite a contemporary audience that might be tired of wars to pause a moment in their busy days to consider a dialogue with the text. The campfire, of course, connects us to the most distant of our ancestors. The witching circle invites the reader to a mystical pause. And the ghost is, and has been since ancient times, a harbinger of important news. You teach creative writing at Brewton-Parker College and show students, myself included, the elements of novel and short-story writing. The story element is strong in this collection, not only in the general design of the book but also in the individual poems. Why such a strong story element? I consider myself a story-teller, whether in poetic form or in fictive form, and I believe that story is fundamental to human relationship. As I mentioned, each person interprets an experience in a manner consistent with his or her own individuation, a Jungian term which suggests that each person experiences greater and greater understanding in his or her life by degrees of experiential perception. Each poem in this collection, therefore, attempts to represent one moment in the life of one person immersed in the politic of the Vietnam War. The culminating power rests in the accumulation, one story after the other, just as life offers an on-going experiential lesson in one's search for wisdom. These are sad poems, despite the humor in some. I noticed also that many of the ending couplets are ironic and harsh. Why is that? War treats individuals, human individuals and individual nations, with cruelty. Our culture, most cultures perhaps, tend to romanticize war. We make songs, sculpt statues, inaugurate parades with marching bands. Those who profit from such brutality must make every effort to mis-inform so that mothers and fathers do not argue when their sons and daughters go to battle. This same shell game induces youth to visualize war as an adventure. In truth, war is deadly serious meanness perpetuated by power for power. Those caught in the killing often do not know how to compromise the reality with the sales pitch. These poems are not about the generals and the corporations that profit from wars; they represent the individuals whose actions eventually settle in the mind and the heart as moral choices. Tell me about these moral choices you refer to. Do you have friends, family even, who have discussed these choices and what it was like for them? Do they find themselves, as you say, "compromising their reality" with a "sales pitch?" Perhaps my comment about compromised reality is unclear. Wars are fought for purposes of political gain. Those who gain are always an elite few. Those few provide the sales pitch, that is the "reasons" for the war or the "moral justifications." Those who fight, either "side," - the good guys or the bad guys - must confront the life-long ramifications of, as you called it, the depravation of the soul. Thus, when the realities of carnage confront the Divinely imprinted moralities of the human spirit, they must confront the contradictions. In fact, the difficulty of adjustment is so profound that many veterans do not or cannot discuss the specifics of their combat experiences. My father, a veteran of WWII, kept a diary. Once, as a teenager, before I left for Vietnam, I found the diary. I began to read it, but my father took it from me. He told me that it was personal, not for anyone but him. Over the years, I've met and corresponded with a number of other Vietnam vets. I even worked as a volunteer with PTSD (Post Traumatic Stress Disorder) soldiers for awhile. Many struggle to make sense of their experiences because the internal struggle between what they did and what they sense as moral imperative - that is, the innate certainty in the dignity of individual life - is so great, that often they cannot bring the resolution to words. That responsibility falls to the poets. Is all of your writing war related? No. All of my writing is life related. How can it be otherwise, unless it were insanity? As I've insinuated, interpretation of earthly experience varies with the innumerable differences between individuals. Story, the individual expression of one's bias turned universal, allows for some possible measure of companionship and perhaps even intimacy. That is what concerns all writers in all cultures in all historical periods. Language, theories, ideologies, and orthodoxies change, but the desire for truth remains intrinsic. Literature provides an essential vehicle for the exploration of meaning in one's search for wisdom. In your search for wisdom, what inspires you? Poetic ideas slip in and out of conscious thought, and one learns eventually to carry a pen and a notebook everywhere because inspiration strikes without warning. That momentary impulse is like a flint-spark of insight from which some fullness emerges from the prolonged process of writing. Inspiration occurs when imagination and memory collide, and each expression of it reveals the unique configuration of the poet's spirit. Regarding inspiration, though, let me refer to Thomas Edison who said that genius is one percent inspiration and ninety-nine percent perspiration. John Gardner suggests that one must read one's work at least one hundred times before trusting that the value of the work has appeared. Louis-Ferdinand Celine admitted that he felt as if he had to write eighty-thousand pages in order to get eight hundred that were worthwhile. True poetry, like any accomplishment of value, comes from prolonged, focused, effort and thoughtful, careful revision. Are all your poems in the form of chapbooks? No. Mostly, I write one poem at a time without any intent to gather like works under one topic or one thesis. I write, if you'll indulge me, what inspires me. I do find the chapbook comfortable, however, especially for poetry. A chapbook lacks the cumbersome randomness found in many collected works. Such volumes require many visits to many poems, and normally one cannot peacefully digest the abundance of value in such a compilation; whereas a chapbook, to reflect one of Poe's dicta, can be read in one sitting. In our fast-paced society, long poems are often out of style, and the notion of an epic presented in poetic diction cannot accomplish the same reader investment as a novel. Yet poems of a kind, blended within a single idea or thesis, invite reader participation, especially if the poems intensify the reading experience through variations of the theme. Do you plan more chapbooks? I know you're working on a novel. Can you tell me about your other writing? I have just finished a chapbook of poems about work titled, Apprentice Lessons. Like Moments, this group contains a thread, in this case lessons from my first carpentry teacher, a man who taught me about craft and about the honor of labor. It contains poems about hammers, chisels, paydays, and so on, with lessons expressed in the ending couplets, similar to the ending couplets in Moments. The novel, Winter Of Barren Dreams, is about a husband and wife and the wife's struggle with insanity. It explores the necessity of maintaining hope and love in spite of life's vicissitudes. The poems in Moments Around The Campfire With A Vietnam Vet flow with an incredible narrative voice spoken from the recollected perspective of a ghost poet with a precise eye for detail, a poet who carries you along the beautiful waterfall of misery with your eyes wide open and your heart in your throat. Each poem commands the page, daring the reader to deny its verity and weight, forbidding the reader to dismiss the small totals of Vietnam we still don't speak about. Wow. These poems took my breath away. Moments Around The Campfire With A Vietnam Vet is full of poignant poems about various characters who fought in the Vietnam War. Thom Brucie's style is direct, his images clear and specific, and the poems often end on a sardonic or ironic note. He makes us feel as though we were actually invited into the camp circle to hear the stories of these people, to know their longings and aspirations and disappointments. This is one of the best books of war poems I've ever read. I promise, you won't be able to put it down.